注意，在本次分享中，我会尽量保持客观，但作为提案的反对者，我不可能以全然中立立场叙述争议双方的观点，并且本次分享将涉及许多 JS 语法语义中的细节问题和一些对普通开发者来说相当陌生的概念。本次分享对于大家很可能将是一场痛苦的旅行。You have been warned! The World Health Organization estimate that 15% of the world’s population has some form of disability, 2-4% of them severely so … which can be divided roughly into four categories: visual impairments, motor impairments, hearing impairments and cognitive impairments. Or there are also some accessibility issues for a normal person in such a situation like driving a car, having a meeting, using a mobile device with a bluetooth keyboard etc. So actually accessibility is not just for the “less amount of people”, but for almost everyone. Have no fallback way for the creative interaction like e-pencil, audio input, face ID, touch ID, NFC etc. Each of them might make user confused, block the user flow or lead user to a no-way-out trap in some certain cases. However, there are already some web standards and best practice to follow which let developers do it better. WCAG: about web content, targeting websites. UAAG: about user agent, targeting browsers, screen readers etc. 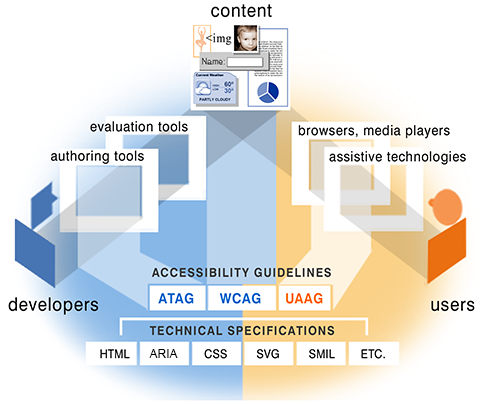 ATAG: about authoring tools, targeting CMS, WYSIWYG editor etc. For web developers, we may pay more attention on WCAG and WAI-ARIA. At the same time, we should know which user agents people use most and how about their support and compatibility to the standard. 小程序应用技术如火如荼，越来越多的公司在打造自己的小程序应用，但小程序的平台也是各自不同，本主提将介绍基于 Vue 语法（Simple File Component）角度，包括 Rax 无线端应用同时支持运行在 weex 环境，淘宝小程序，支付宝小程序，微信小程序等，践行 Write Once, Run everywhere! What technologies could replace GraphQL in the future? How can we mix ideas from Vuex and long-standing ideas from the 80s to make the better user experience for our web applications? Andrey Sitnik, the creator of Autoprefixer and PostCSS, will explain why I switched from making improvements to CSS tooling to pursuing CRDT ideas.